I was in a Christmas Tree Shop recently, and saw some familiar things -- colorful metal geckos hanging on the walls, and beaded lizards walking across a table. They looked familiar because I have carried both. The metal geckos I've carried are steel-drum art, hammered and shaped and painted by a men's co-op in Haiti (recently back in business after the devastating earthquake). 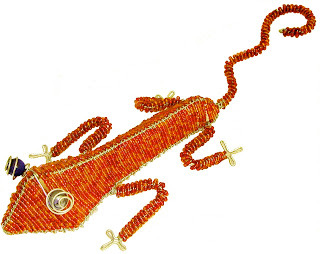 The beaded lizards are from a South African organization that provides school and support to children of AIDS victims. But the geckos and lizards I was looking at were not quite right. They weren't striking. They had no vitality. I couldn't figure it out. They just didn't look jaunty, just lifeless. Then I turned them over, and I saw a clue to their lifelessness. I also noticed that they wouldn't be providing any of the social and economic benefits of the ones I've carried. These were factory-made in China. They were, of course, less expensive. And everyone is on a budget. But when you spend your money on ethnic-looking home decor, think about where that money will go. Do you want the artisans to receive a fair living wage? Do you want to support a region's economic recovery, and causes that rely on enterprise to fund their operations? Think, too, whether you are supporting a vital artisanry or mechanical knock-offs. Those knock-offs lacked an artistic vitality because there were no vital artists at work. Look for the country of origin when you shop. Or ask. Or buy your home decor from a member of the Fair Trade Federation. Like us! We've posted a separate blog entry with ideas for fair-trade gifts for wedding guests to bring. Wedding planners (whether professional, or members of the wedding party) can continue the theme of a fair-trade wedding by providing gifts and accessories for the bride's attendants that reflect the couple's commitment to cooperation and justice. Bridesmaids can adorn themselves with tagua-nut bracelets as part of the wedding's color scheme, at the reception, or later as a memory of the big event. 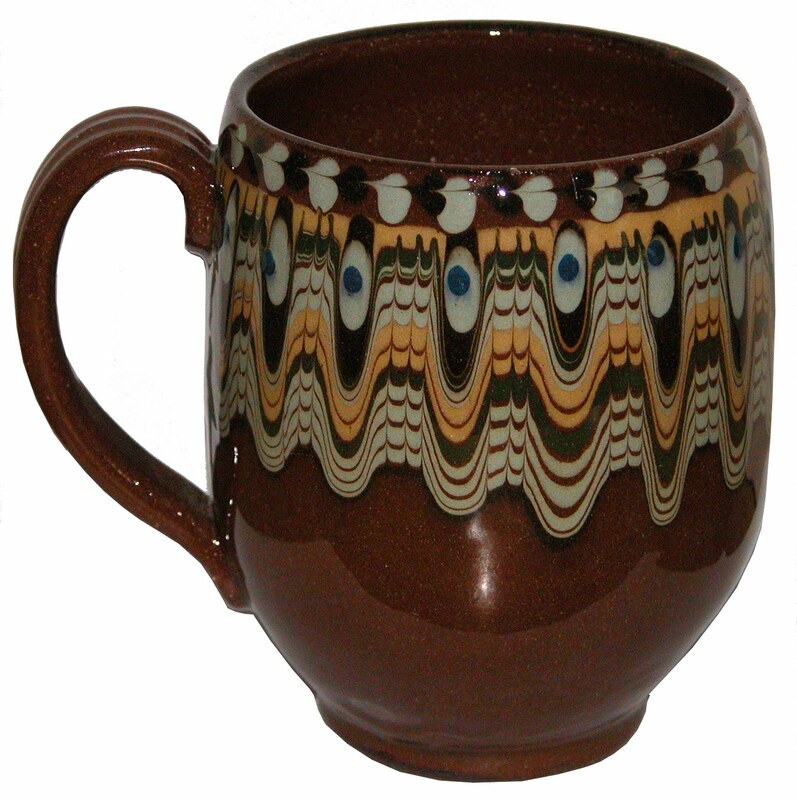 We carry a variety of colors and styles on our World of Good website. Tagua is made from the nut of a Colombian palm tree that is dried and dyed. Farmers who sell tagua now earn enough to stop growing coca leaf for the cocaine trade. Brides should know their gifts to the wedding party not only commemorate their day, but bring economic freedom to Colombian families. 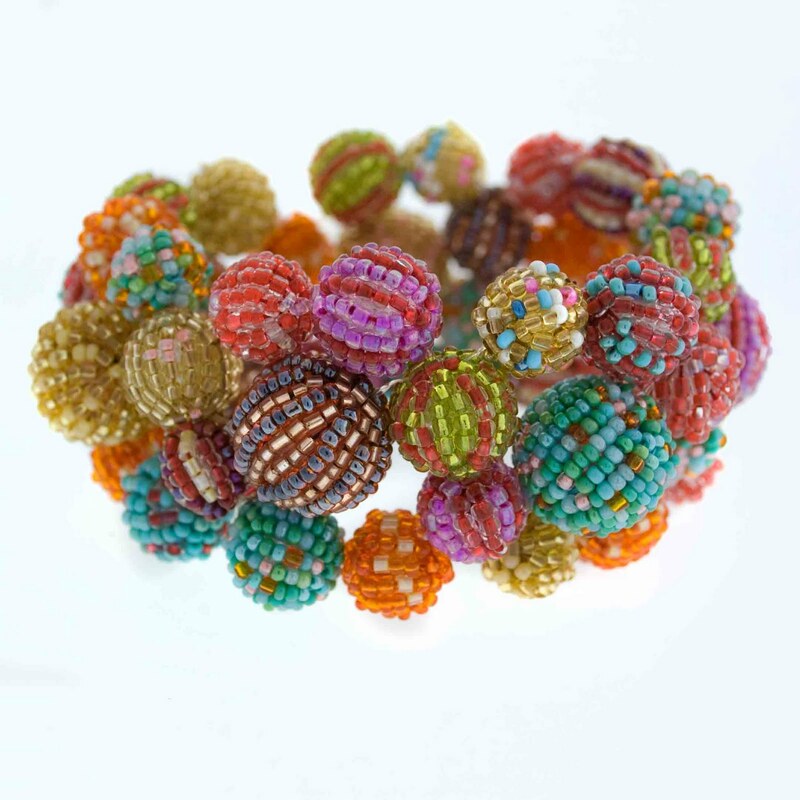 Our Nepali beaded bracelet also comes in a variety of palettes, should the bride wish to coordinate accessories with her attendants' gowns. 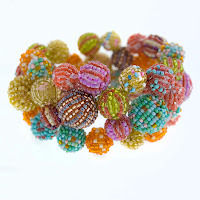 Brought to market by a fair-trade wholesaler who is a former Peace Corps member, these bracelets are fashioned by women who are earning money to send their daughters to school. Our World of Good earring selection features price points ranging from under $20 (Kenyan recycled metals) to over $40 (intricate Guatemalan beadwork). Our web site features an even greater selection. At the reception, your guests find their table strewn with a variety of our Kenyan hearts. These hearts are carved out of soapstone from the Kissi district of western Kenya. Dyed and batiked in Nairobi, they are a cheerful and affordable table favor. The bride's attendants will look extra-spectacular. The guests will be charmed by their favors. The wedding will be part of the fair-trade movement. And the day will be even more meaningful than before. Trade is an economic partnership based on dialogue, transparency, and respect. What better way to start your new life together than choosing items for your wedding that represent these values?" We have lots of ideas for fair-trade wedding gifts. As featured on page 31 in the FTF guide, our wedding mola would make a spectacular gift. 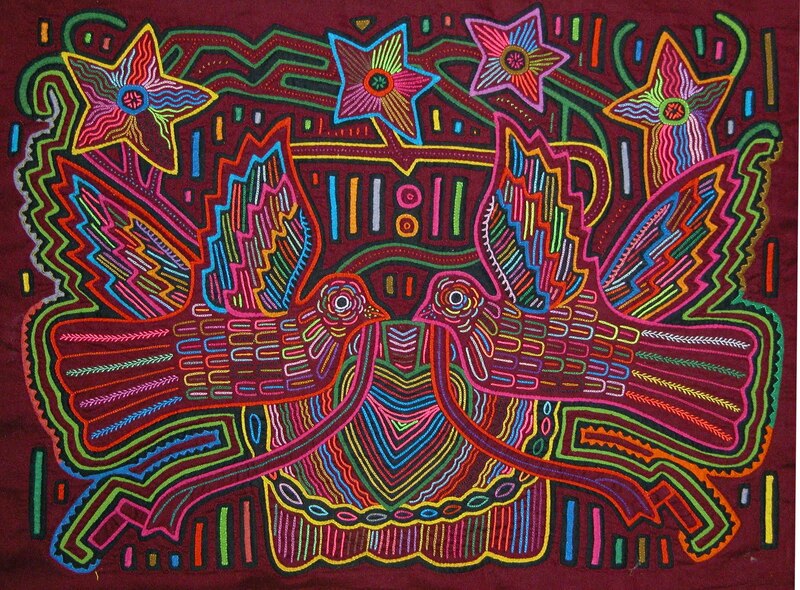 Handmade by the Kuna women of the San Blas Islands of Panama, this mola uses reverse appliqué. The women layer fabric and cut intricate patterns that expose colors in the underlying layers. This one-of-a-kind piece is collector quality with fine, even lines, invisible sewing and lovely composition. 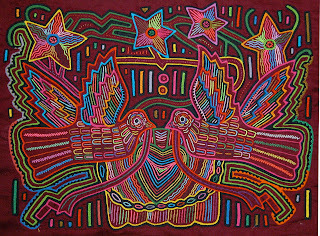 Our molas look beautiful framed (we recommend a framer who specializes in textiles), or fashioned into a sumptuous cushion cover. 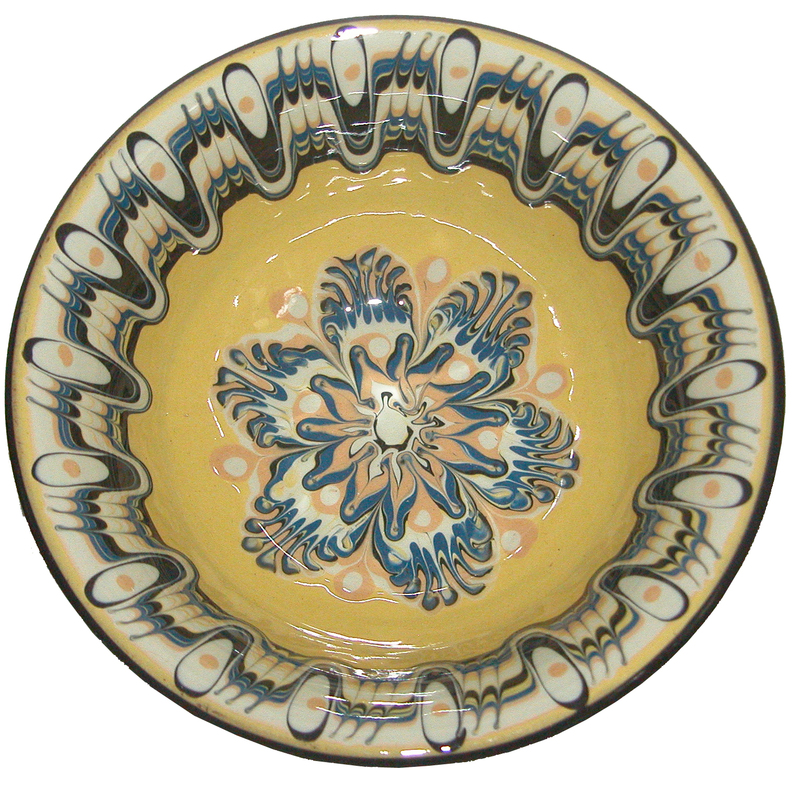 Those who like to give tableware should check our our offerings from Bulgaria. 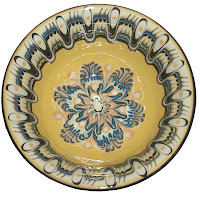 Traditional designs have been incorporated into ceramic tableware that is food-safe, ovenproof, and microwaveable. Crossroads Trade carries plates, individual and serving bowls, mugs, and steins in a variety of colors and patterns. 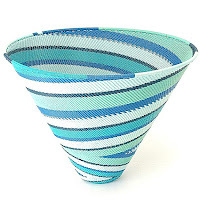 Our telephone-wire baskets from South Africa are part of a story of local entrepreneurship. 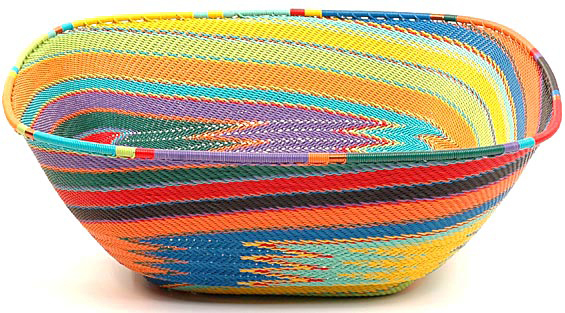 The first telephone wire baskets were made from multi-colored plastic-coated telephone-wire scraps, which had been carefully saved by basket weavers.After much experimentation, the artisans devised a technique of weaving over a form a fantastic multi-color bowl from the top down. As the baskets became more popular, telephone lines were raided to provide more raw materials. Our suppliers now use specially-purchased telephone wire for their works. 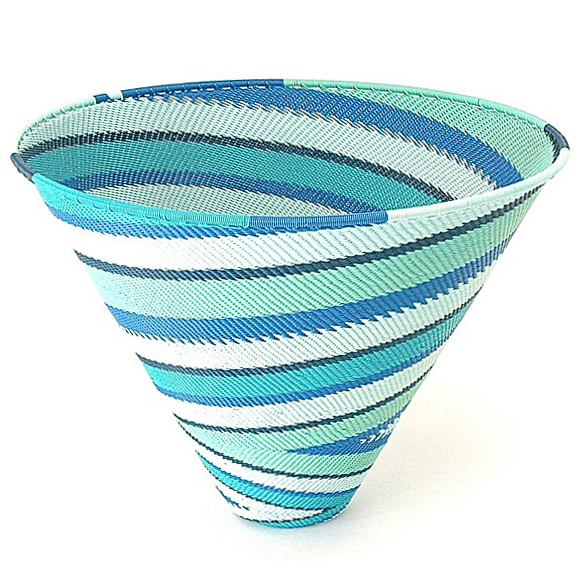 Our Rwandan baskets are part of the story of Rwanda's rebirth following the 1994 genocide. The thousands of widows and orphans who were left alone after the slaughter are rebuilding their lives through their own talents, including the hand crafting of these baskets. 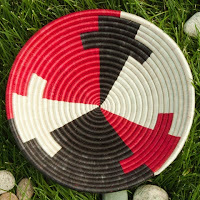 Our baskets are not only beautiful and useful, but contribute to that rebuilding process. We have lots more items on our Crossroads Trade web site and our pages on World of Good. We ship all over the world, either to you or to the happy couple. Bring extra-meaningful congratulations and best wishes this wedding season.